Adams had always considered himself a political independent, and he was given a chance to prove this in the U.S. Senate. After his election, he was set upon by forces opposed to the Federalist Party, of which Adams was considered a member, and political enemies of his father. Instead of accepting his fate as a powerless and unpopular member of an unpopular political minority, Adams asserted his political independence. He began to vote with President Jefferson and the opposition Democratic-Republicans, and broke with his party completely in 1807 by supporting the Embargo Act (46 App. U.S.C.A. § 328). This act, backed by Jefferson, placed an embargo on all foreign commerce. The act was opposed by the Federalists and the New England states, who wanted to encourage trade with the British. They feared that the Embargo Act would stifle New England's economy. 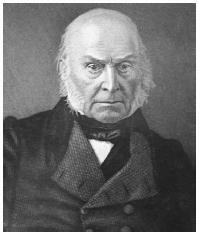 Adams voted for the Embargo Act, against the wishes of his party and region, believing that it benefited the nation as a whole. Adams shone brightly from 1831 to his death in 1848. He remained independent of party politics, and held important posts in Congress, serving at times as chairman of the Foreign Affairs Committee and of the Committee on Manufactures. Adams was conspicuous as an opponent of the expansion of Slavery and was at heart an abolitionist, though he never became one in the political sense of the word. He took center stage during debates over the gag rules, which resulted when abolitionists sent many petitions to Congress urging that slavery be abolished in the District of Columbia and the new territories. Southern members of Congress who did not want to discuss slave issues passed a series of rules, known as the gag rules, that kept the abolitionists' petitions from being read on the House floor, effectively blocking any discussion of slavery. Adams fought the gag rules as violations of the right of free speech and the right of citizens to petition their government as guaranteed in the First Amendment. As the leading opponent of the gag rules, Adams became the person abolitionists sent their petitions to. He, in turn, tried to have the House consider those petitions, only to run up against the gag rules. For several years, Adams tried unsuccessfully to have the rules repealed, but he was able to win supporters to his side each time he tried, and in 1844, he finally succeeded in having the rules abolished. Another contribution of Adams to the antislavery cause was his championing of Africans on the slave ship amistad. The slaves had mutinied off the coast of Cuba, capturing their masters. The slaves, unfamiliar with navigation, asked their captives to help them sail to a country where slave trade was illegal. The former masters took advantage of the slaves' navigational inexperience and directed the ship into U.S. waters near Long Island, hoping to find sympathetic U.S. authorities. Adams was one of two attorneys who argued the case of the Africans before the U.S. Supreme Court, defending the blacks as free people. President Martin Van Buren had taken the position that the slaves must be returned to their masters and to their inevitable death. Adams helped win their freedom (United States v. Libellants of Schooner Amistad, 40 U.S. [15 Pet.] 518, 10 L. Ed. 826).